Definitely got the itch to sew something for my girls after seeing all the awesome things people were making for their kids for Kids Clothes Week. Did you join in? I admit that I’ve lost interest in sewing clothes for my girls. A few classic things is about all they’ll actually wear. I really got over making things I thought they would like after seeing those pieces languish in the drawer and outgrown before they ever got any real use. I kind of miss the days when they’d wear anything! They do like things to be comfy so I try to sew with knits as much as I can and pick things that are easy to move around in. I still have it on my list to make that one blue dress into a pattern, one of these days. The Oliver + S Field Trip Raglan shirt just came out as a separate digital release and I had to try it! It truly is a quick and easy pattern to sew. And with the awesome tips and tricks from the Kniterviews series that Rae just finished up, I think anyone could give it a try and be successful. I made this awesomely bright tee in a size 8. It’s roomy and the sleeves and length were pretty long, but very easy to hem up. I like that there’s plenty of length, always easiest to shorten something! Just to be aware of that in case you’re sewing for a grandchild or neighbor or whatever. I made the back a little longer because I like that look, everything else was just as written in the pattern. For the little floral number I originally made it a size 6 for Emily. But my Emily is a tiny little flower and it was pretty swimmy on her. Just for kicks I threw it on Natalie and it’s so cute! I love that the fit is a little more snug and fitted and the little skirt making it a tunic just kills me. I just loved seeing her dance around in it. The back neckline was a little itchy so I sewed on a strip of cotton twill tape (like you would see in most store bought tees). That did the trick! Anyway, two comfy tees. Check! Even if I am a little prejudice being Gramma- love it! Gaahhh! Natalie is looking so much like you, especially with her hair up! Such sweet tees! These are both very sweet…I think I will be sad when my girls don’t want me to sew for them anymore 🙁 I have that HR fabric in a couple of colors, I need to use it! I just got this pattern in the mail today! (the whole outfit) My daughter looked at it and said “Oh, boys clothes…” I told her the shirt would be cute for girls too, but she just couldn’t see it. I was able to show her your cute girly version and now she is looking forward to whatever I make. So pretty! I love the colours and styles. Your little ballerina is beautiful too. Very cute indeed. Nice fresh colors. They look great! If it were me as a kid, I would have told my Mom to leave off the “dorky” pocket. LOL! These look fantastic! I would never have guessed they were “homemade” they look so professionally done. I especially love the simple coral T. Does the pattern come in adult sizes? I totally want to make my own. If they shirt is small enough, the arms are always waaaaay too short. I guess they think because I have a small frame I must be short or something. Thanks Christina!! 🙂 I don’t think Oliver + s has this for their adult line yet. But my friend Adrianna just put out a raglan tee pattern for women. She’s a really great pattern writer so I’d definitely give it a try!! Love that about sewing for yourself, making adjustments like that is so easy! Those are both so cute Anna! I didn’t see this pattern but will probably give it a try. Very cute, hope they wear them! Love them! That coral is really gorgeous. My girls would live in these shirts too. It looks like your girls are getting used to modeling for you. 😉 So cute!! Beautiful! What a great idea to turn the raglan into a skirted tunic! Those shirts do look comfy! I love the happy, bright fabrics. Your daughter is just lovely! These are so cute–doesn’t hurt that your models are adorable! I’ve stopped sewing for my daughter because she lives in t-shirts but these are inspiring! Thanks for a great post! So pretty Anna! Love the hi-lo touch. Natalie is such a beauty and looking like more and more like a young lady! Would be great to be your daughter! Thanks for the twill tape idea! I’ve noticed it in my boys’ tops but never tried it. Is it really so simple as sewing over the seam? These are darling! I just love the skirted one, and it looks so cute with the 3/4 sleeves. The coral one is great too, I love that bright color on little girls. Your girls are beautiful models! 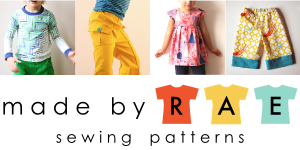 Now I got the itch to sew some clothes for my kid with knit! Both tees are so nice, Anna! Natalie looks so lovely in the floral one! Both of the shirts look fabulous! I have this pattern and would love to make the tunic version like you did. This may be a stupid question, but how did you decide where to start the skirt part?